Dushanbe is the capital and largest city in Tajikistan. Among the former Soviet republics Tajikistan has struggled almost since its founding. When independence arrived in 1991, the country was almost immediately plunged into a civil war. The five years struggle devastated the domestic economy, and has kept Tajikistan the poorest nation in Central Asia. The over dependence on Russia, has hampered internal development in the ensuing decades. Although Tajikistan has been politically stable since the ending of hostilities in 1997, the country has never really recovered economically. Poverty remains widespread and the country is far too reliant on agriculture and outside aid, to fund the needed infrastructure. The Civil War was fought between a government backed by Russia and the opposition, which had Islamist roots. By the time the United Nations brokered a peace, near 50,000 people had been killed and more than 10% of the population had left the country. Since 1992, President Imomali Rahmon has been in power, despite the continuous allegations of electoral fraud. Over the years he has fostered a strong relationship with Russia and remains quite reliant on them, to meet security needs. Russia has maintained military posts inside Tajikistan. In 2004, the Russian government made the decision to reoccupy a former space monitoring facility, that had been built by the Soviet Union. There is also a military base in the capital city of Dushanbe. A Tajik dry fruit seller. Recently, there has been a renewed interest in Tajikistan by Russian President Vladimir Putin. Many observers feel that this is the result of the increasing influence of the United States. The economy of Tajikistan remains largely dependent on agriculture. About half of the overall population is engaged in the vocation. Cotton is the principal cash crop. This one plant accounts for 60% of all output in the sector. Near 75% of the rural population is engaged in farming of cotton and it consumes some 45% of all irrigated land. The TadAZ aluminium smelting plant, in Tursunzoda, is the largest aluminium manufacturing plant in Central Asia, and Tajikistan’s chief industrial asset. In contrast, only about 20% of the populace are employed in industry. Aluminum production is of paramount importance to the overall economy. It is dominated by the state owned Tajik Aluminum Company. The firm has the biggest manufacturing plant in Central Asia and one of the biggest facilities globally. Tajikistan is energy deficient and relies on gas and oil imports. However, the country has great potential for further development of hydro-power, since there are a number of rivers and the country is 90% covered in mountains. 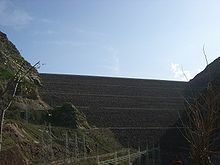 The Nurek Dam for example, is the highest in the world. Nonetheless, there will need to be far more investment in this endeavor, to meet the internal energy needs of the country. Full utilization, would even allow the export of hydroelectricity to neighboring countries. It is reported that 47% of the GDP (Gross Domestic Product) is earned by migrants working outside the country. Many of them are working in Russia, since many Tajiks speak Russian as a second language. As of 2014, the country was listed as having the most remittance dependent economy in the world. The present downturn in the Russian economy, has led to many young Tajik men being forced to return home. Unfortunately, there are few real domestic job prospects available to them. 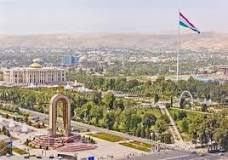 The economy of Tajikistan is unsteady, owing to uneven reforms, mismanagement and outright corruption. It also remains highly vulnerable to external shocks because of the overall dependence on just a few experts and money from abroad. The main competitive advantage for the country is cheap labor. 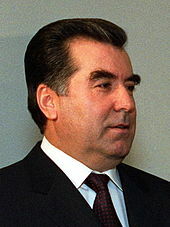 President of Tajikistan, Emomali Rahmon, has ruled the country since 1994. President Rakhmon has moved to increase economic ties with China over the years. The Chinese government has assisted in the construction of roads and tunnels. Their assistance has been vital in building the infrastructure necessary for electricity and other energy needs. China has extended numerous credits to further foster ties between the two countries. Individual Chinese firms are investing in numerous gas and oil ventures, as well as mining projects. Exploration for energy resources and gold are ongoing. The recession of 2009 was a threat to remittances from abroad. The poor economic conditions have increased the need for foreign assistance, with Russia being one of the main benefactors. Hundreds of thousands of people are still living with food insecurity. Economic adversity is a contributing factor to the renewed interest in religion. Among the young which are often unemployed, the more radical forms of Islam hold special appeal. Unemployment although officially low at just 2.30%, is actually 10.9%. Youthful joblessness, is suspected to be far higher. Inflation last month, reached 6% on an annual basis. 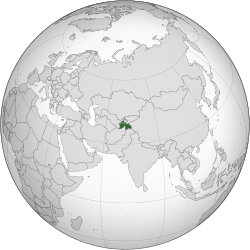 Tajikistan on a global map. The impoverishment of the country has been conducive to the drug trade. Smugglers cross the border from Afghanistan on a regular basis. As a result, Tajikistan is often the first stop in an illicit export of drugs. Many of these illegal substances will continue on from there to Russia, Europe and further west including the United States. The nation is ranked 3rd for heroin and raw opium confiscations. The money associated with these illegal drugs has led to further corruption of government officials. 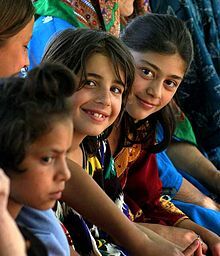 Tajikistan has a young population, with nearly a third under the age of 14. Out of 8.5 million people, Uzbeks make up nearly 25% of the citizenry. Despite prevalent impoverishment, the state provided education has permitted the country to maintain a literacy rate that exceeds 99%. The nation has been accused of permitting training camps for Islamist rebels on its territory. The government denies this adamantly, but unconvincingly for an increasing number of their neighbors. Tajikistan shares borders with the nations of Afghanistan, Kyrgyzstan, Pakistan, Uzbekistan and most importantly China. 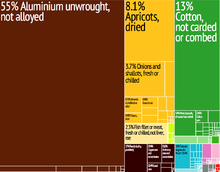 Graphical depiction of Tajikistan’s product exports in 28 color-coded categories. Relations with next door Uzbekistan remain strained and the Russian military fully controls the border with Afghanistan. The only way forward for Tajikistan is to diversify and deepen its industrial base. This will provide more employment for the citizenry and reduce the economic dependence on Russia. Increased productivity in agriculture is also needed, to improve living standards in the rural areas of the country. Greater attention needs to be placed on reducing barriers on private investment. It is the best way to return the country to higher levels of economic growth. Although GDP growth averaged 7% from the years 2007 to 2015, it was only 3.66% from 1992 until 2016. Tajikistan did join the World Trade Organization in 2013. Conditions abroad are putting increasing pressure on Tajikistan. Yet, GDP still expanded by 6.50% in the first quarter of 2016. The total size of the economy is equal to $7.85 billion USD (United States Dollars). It was $9.24 billion USD as recent as 2014. GDP as far as Purchasing Power Parity (PPP), is equal to $22.3 billion USD. Per capita that is $2,688 USD. GDP growth for this year is forecast to be just 4%, after a recent revision downward by leading analysts. In 2017, economic expansion is projected to be 4.8%. This is insufficient growth for a country at this stage in economic development. It will be inadequate to move a far greater percentage of the population out of poverty. 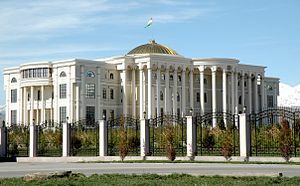 View of the Palace of the Nation (Presidential Palace) in Dushanbe. The rule of law is weak in Tajikistan. Bribery and overall corruption are widespread. One party rule and the entrenched presidency of Rahmon facilitates the poor overall governance. There is constant state interference on decisions regarding investment and development of the private sector. The judiciary system has little independence in most matters. Political patronage and regional contacts are paramount, in conducting business inside the country. They are also central to most governmental decisions. The authoritarian rule of President Rahmon is solidified by the fact, that at least two of his children hold senior government positions. Other members of the family, maintain extensive business contacts across the country. State-owned enterprises dominate the major sectors of the economy. This creates a stifling atmosphere for investors. All private investment is screened by the government and requires government approval. Capital acquisition remains a major handicap for entrepreneurs. A further complication, is that fact that all land belongs to the state. As a result, most Tajiks are part of the underground economy. The world economy continues to slow and the downward pressure on commodities is having a substantial impact on Tajikistan. The rate of remittances is a crucial, to the overall health of the domestic economy. The reliance on Russia for this aspect of growth, when that country is in recession, has proved to be extremely detrimental for further development. Tajikistan is coming under increasing pressure to join the Russian dominated Eurasian Economic Union. Kyrgyzstan joined a year ago, and was given little choice in the matter. The economic and political dominance of Russia in the region made it inevitable. President Rahmon has stated publicly, that a formal application to join is likely to come in 2017. It will in reality, force the country in a tightening Russian orbit. A consistent bright spot for the country has been the prudent management of state finances. Government deficits have actually been falling. The debt to GDP ratio, is at a low level of just 30%. However, the poor economic conditions have still led to the domestic currency the somoni, to slide in value this year. Tax revenues have shrunk so fast this year, that officials are now demanding that formal businesses pay their taxes in advance. Although the government has stated a goal of doubling GDP within the next decade, how to achieve this without fundamental economic restructuring has become problematic. The hurdles of low productivity, poor transport and insufficient infrastructure including electricity, cannot be solved easily. It will take massive infusions of new investment both from the private sector and governmental sources. Where this money will come in the present environment is questionable.